This dish has an amazing creamy texture and can be teamed with puris or parathas to really enjoy this meal. However I also like to serve it cold as a wholesome breakfast treat! I’ve always cooked this dish with Slim Milk, or No Fat Milk, however as this was a celebratory meal, I went all out and used whole milk…and boy did it change the flavours. The end product was super creamy and smooth and the delicious seviya that is pre-cooked (shallow fried in home-made ghee made from cow’s milk) took on a silky texture. I wish I could add a sample here for you guys to taste! What’s more since the milk didn’t need to be reduced much, the cook was done is 40 minutes as against the 2 hours it usually takes. Having said all of this, I would still go back to slim milk…its healthier. 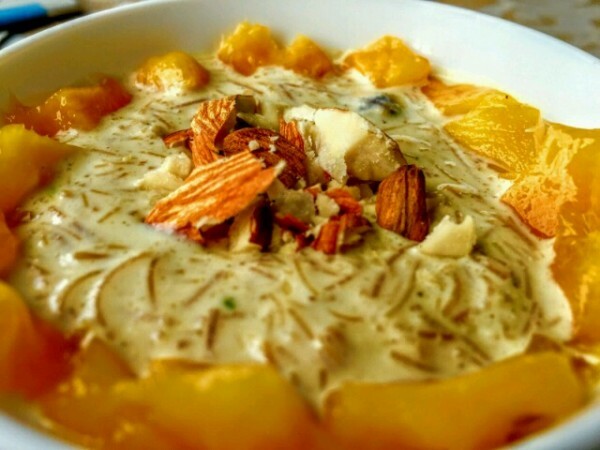 Optional: if you have access to Everest Milk Masala, you could use about 4 tablespoons of this instead of the freshly ground cardamom powder, pistachio and nutmeg powder. 1. Measure out the vermicelli. 2. 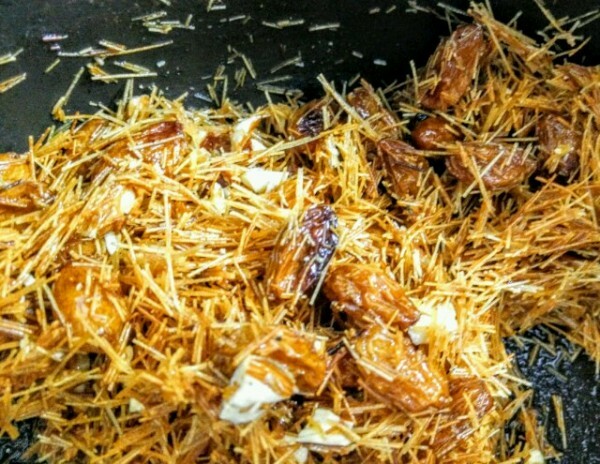 Heat ghee in a thick bottom pan and fry the vermicelli on a low flame till it is golden in colour. You should be able to smell the roasting vermicelli when it’s done. It’s heavenly. Add the roasted crushed almonds and raisins fry for another minute. 3. Add the milk, keep stirring to make sure the milk or vermicelli doesn’t stick to the bottom. You could keep a spoon across the top of the pan, such the end of the spoon sits right at the edge of the pan, this doesn’t allow the milk to boil over. It takes some practice to perfect this..but trust me it works. 4. 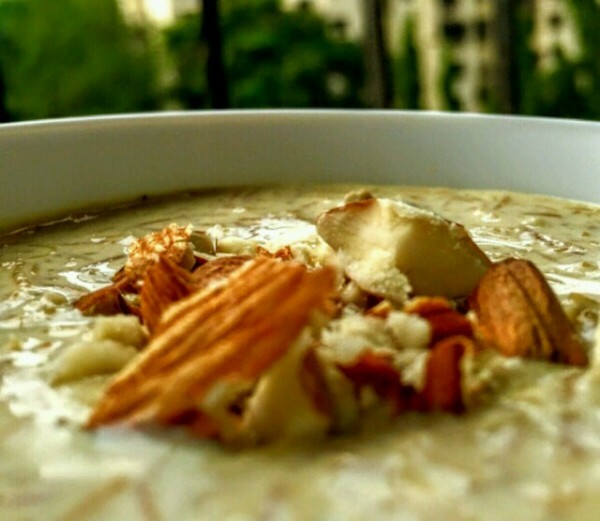 Let the kheer cook for at least 20 minutes, or till the milk has reduced by close to half. 5. Now add in the sugar-free. (If you’re using sugar add 1/2 cup of fine sugar, the raisins will add their sweetness too). Stir it in. When mixed, you can garnish your dish with fried almonds and some more raisins. Taste it, if you think the sweetness isn’t enough, add powdered sugar or sugar substitute to suit your tastes. TIP: It will be sweeter when its hot as opposed to when eaten cold. So keep that in mind when you sweeten your dish. 6. 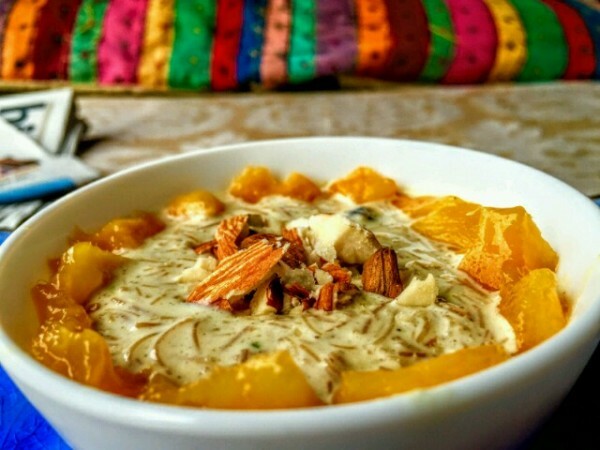 To serve: You could serve this hot with puris or paratha or cold with a ring of freshly cut mangoes. It’s perfect way to end a celebratory meal or start a weekend.